On Sept 14th 2014, I published this letter to the editor about the Harper Conservatives buying votes with a gimmick with a credit on Employment Insurance premiums. The local SDSG federal Liberals are active and well. The Cornwall FreeNews interviewed me during the recent annual BBQ at Lost Villages on Sunday August 17th 2014. I extend a special thanks to Del, Tracie, Claude, Jamie, Ryan and many others who made the BBQ a success. The CFN writes its story in a way that diverges considerably from my interview, insinuating that I am running for the Liberal nomination when I said the opposite. I particularly disagree with the editorial comments written about my friend and our past candidate Bernadette Clement. I find that Bernadette is a hard working, fair, and very competent Councillor for the city of Cornwall. On August 8th 2014, I published this letter to the editor in the local media about our Conservative MP Guy Lauzon abusing tax dollars by publishing a very partisan tax guide. It appeared in the Cornwall FreeNews and the Standard-Freeholder. 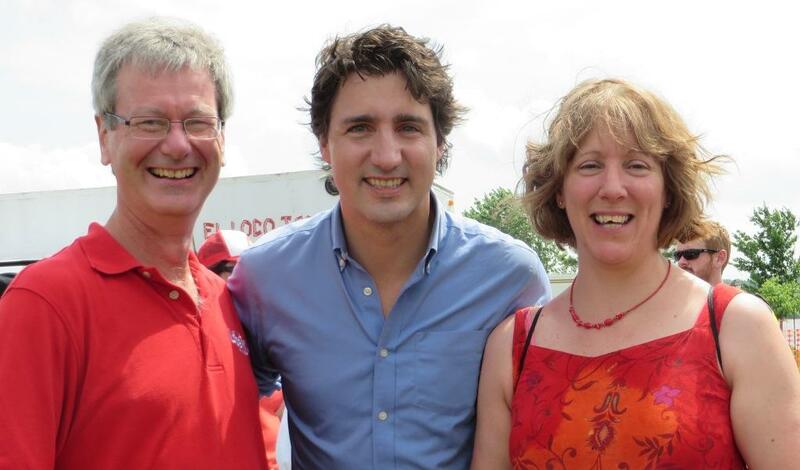 Isabelle and I were particularly thrilled to join supporters and welcome Justin Trudeau to Cornwall for Canada Day on July 1st, 2014. The crowd loved him. He was very congenial, easy to talk to, and so natural with his two kids. The Chesterville Record printed my letter to the editor on March 26th 2014 about a government for all Canadians. Left to right - David Jones, the Honorable Stéphane Dion, and Tom Manley. I reported from the floor of the biennial convention in Montreal of the Liberal Party of Canada in the spring of 2014. Municipalities and the infrastructure deficit. Grass Roots Policy Development in the Liberal Party. Media management at the Liberal convention. My impressions of the biennial Liberal convention. The Chesterville Record reported in 2008 that the Grit Green Shift’s DNA was unearthed in Berwick. Ian Cummings wrote about me recently in the Ontario Farmer newspaper - Tom Manley - a Practical Liberal. I ran for public office three times, most recently as the Liberal candidate in SDSG during the 2006 federal election. In 2005, I left the Greens for the Grits. Prior to that, I was the Deputy Leader of the Green Party of Canada and ran federally for the Greens in 2004 and provincially in 2003. The Open Politics website carries a good biography of my political activities. In the 2004 federal election, as the federal Green Party agriculture critic, I joined the Big Leagues to debate agriculture in a national forum with the agriculture minister and critics of the other parties.